Creating unique, personalized T-shirts, bags, and banners has never been easier! Jacquard Iron-On Transfer Paper quickly turns drawings, photos, clip art, scanned images, and text into wearable art and home décor. Just run it through any inkjet copier or printer — you can even draw directly on the transfer sheet with crayons, markers, or ink! Then iron your image onto any lightweight fabric following the included instructions. Jacquard Iron-Transfer Paper has an exceptionally soft feel, so the transferred image feels like part of the fabric. 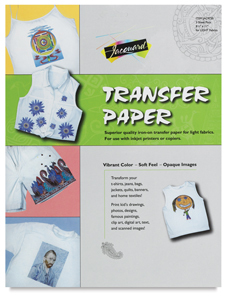 This versatile transfer paper is great for kid's projects as well as for one-of-a-kind artwork. Each package contains three 8½" × 11" (22 cm × 28 cm) sheets.